Antioxidants as therapeutic agents? Should we be including iron chelators in such clinical trials? We review the considerable and wide-ranging evidence for the involvement of this combination of (su)peroxide and poorly liganded iron in a large number of physiological and indeed pathological processes and inflammatory disorders, especially those involving the progressive degradation of cellular and organismal performance. These diseases share a great many similarities and thus might be considered to have a common cause (i.e. iron-catalysed free radical and especially hydroxyl radical generation). The studies reviewed include those focused on a series of cardiovascular, metabolic and neurological diseases, where iron can be found at the sites of plaques and lesions, as well as studies showing the significance of iron to aging and longevity. The effective chelation of iron by natural or synthetic ligands is thus of major physiological (and potentially therapeutic) importance. As systems properties, we need to recognise that physiological observables have multiple molecular causes, and studying them in isolation leads to inconsistent patterns of apparent causality when it is the simultaneous combination of multiple factors that is responsible. This explains, for instance, the decidedly mixed effects of antioxidants that have been observed, since in some circumstances (especially the presence of poorly liganded iron) molecules that are nominally antioxidants can actually act as pro-oxidants. The reduction of redox stress thus requires suitable levels of both antioxidants and effective iron chelators. Some polyphenolic antioxidants may serve both roles. Understanding the exact speciation and liganding of iron in all its states is thus crucial to separating its various pro- and anti-inflammatory activities. Redox stress, innate immunity and pro- (and some anti-)inflammatory cytokines are linked in particular via signalling pathways involving NF-kappaB and p38, with the oxidative roles of iron here seemingly involved upstream of the IkappaB kinase (IKK) reaction. In a number of cases it is possible to identify mechanisms by which ROSs and poorly liganded iron act synergistically and autocatalytically, leading to 'runaway' reactions that are hard to control unless one tackles multiple sites of action simultaneously. Some molecules such as statins and erythropoietin, not traditionally associated with anti-inflammatory activity, do indeed have 'pleiotropic' anti-inflammatory effects that may be of benefit here. Overall we argue, by synthesising a widely dispersed literature, that the role of poorly liganded iron has been rather underappreciated in the past, and that in combination with peroxide and superoxide its activity underpins the behaviour of a great many physiological processes that degrade over time. Understanding these requires an integrative, systems-level approach that may lead to novel therapeutic targets. The 'balkanisation' of the literature is in part due to the amount of it (some 25,000 journals with presently 2.5 million peer-reviewed papers per year, i.e. ~5 per minute ), with a number http://www.nlm.nih.gov/bsd/medline_cit_counts_yr_pub.html increasing by something approaching 2 per minute at PubMed/Medline alone. In addition, the disconnect between the papers in the literature (usually as pdf files) and the metadata describing them (author, journal, year, pages, etc) is acute and badly needs filling . Without solving this problem, and without automation of the processes of reading, interpreting and exploiting this literature and its metadata in a digital format, we cannot make use of the existing tools for text mining and natural language processing (e.g. [3–5]), for joining disparate concepts , for literature-based discovery (e.g. [7–11], and for studies of bibliometrics [12, 13], literature dynamics , knowledge domains , detecting republication  and so on. Until we recognise these possibilities we are unlikely to seek to realise them. The present article (and see  for a preprint) serves to show some of the benefits than can accrue from a more overarching view of the otherwise highly disparate literature in a particular domain (see also ), but was done 'the hard way', i.e. with a few bibliographic and bibliometric tools but without the kind of automation implied above. For the record, the main tools used (see a review in ) were Web of Knowledge and Scopus for literature and citation searching, supplemented by Google Scholar. Some use was also made of ARROWSMITH [6, 19, 20] and GOPubMed , as well as various workflows in the Taverna environment [22–26], including the BioAID_DiseaseDiscovery workflow http://www.myexperiment.org/workflows/72 written by Marco Roos. Citations and attendant metadata were stored in Endnote (latterly version X). Even under 'normal' conditions, as well as during ischaemia when tissue oxygenation levels are low, the redox poise of the mitochondrial respiratory chain is such that the normally complete four-electron reduction of dioxygen to water is also accompanied by the production, at considerable rates (ca 1–4% of O2 reduced), of partially reduced forms of dioxygen such as hydrogen peroxide and superoxide (e.g. [27–45]). These 1- and 2-electron reductions of O2 are necessarily exacerbated when the redox poise of the b-type cytochromes is low, for instance when substrate supplies are in excess or when the terminal electron acceptor O2 is abnormally low due to hypoxia or ischaemia. Various other oxygenases, oxidases and peroxidases can also lead directly to the production of such 'reduced' forms of dioxygen in vivo (e.g. [46–48]), with H2O2 from xanthine oxidase being especially implicated in ischaemia/reperfusion injury (e.g. [47, 49–54]). These molecules (peroxide and superoxide) can cause or contribute to various kinds of oxidative stress. However, this is mainly not in fact because they can react directly with tissue components themselves, since they are comparatively non-toxic, cells have well-known means of dealing with them , and they are even used in cellular signalling (e.g. [56–60]). Much more importantly, it is because they can react with other particular species to create far more reactive and damaging products such as hydroxyl radicals, with all these agents nevertheless being known collectively (and indiscriminately) as reactive oxygen species (ROSs). Possibly the commonest means by which such much more damaging species, in particular the hydroxyl radical, are created is by reaction with unliganded or incompletely liganded iron ions [61–63]. The themes of this review are thus (i) that it is this combination of poorly liganded iron species, coupled to the natural production of ROSs, that is especially damaging, (ii) that the role of iron has received far less attention than has the general concept of ROSs, albeit the large literature that we review, and (iii) that this basic combination underpins a great many (and often similar) physiological changes leading to a variety of disease manifestations, and in particular those where the development of the disease is manifestly progressive and degenerative. An overview of the structure of the review is given in Fig 1, in the form of a 'mind map' . The main literature review for this meta-analysis was completed on June 30th, 2008, with some updates being added following the refereeing process. 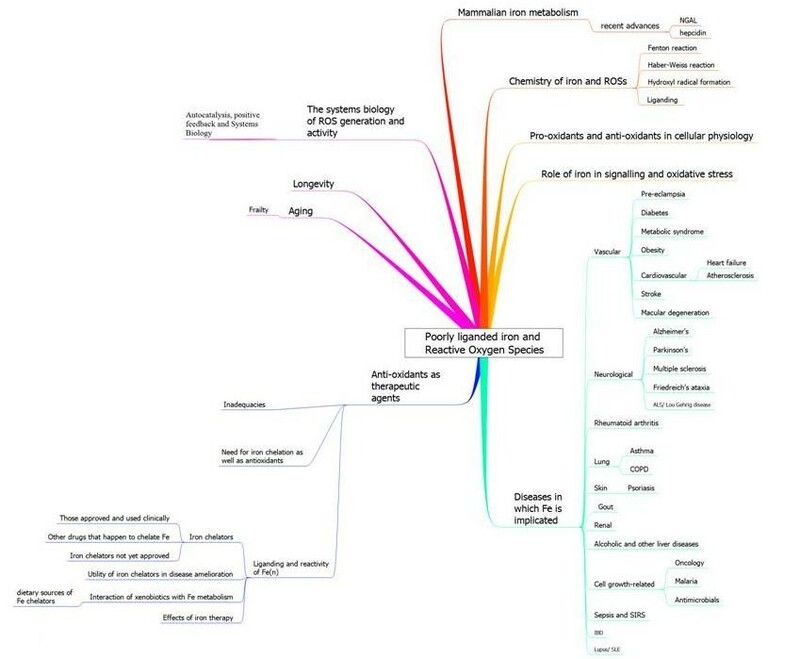 An overview of this article, set out in the form of a 'mind map' . These together, were their activity in the relevant locations sufficiently great, might serve to remove (su)peroxide from cells completely. In addition to reactive oxygen species there are ions such as the perferryl ion (Fe-O)  and reactive nitrogen species [60, 145–147]. These latter are mainly formed from the natural radical NO, an important inflammatory mediator , with peroxynitrite production (from the reaction of NO and superoxide) [46, 149–154] leading to nitrotyrosine , or nitro-fatty acid [155, 156] or protein cystein nitrosylation [157, 158] being a common means of their detection downstream. Other toxic products of the reactions of NO include NO2, N2O3, and S-nitrosothiols , and the sequelae of some of these may also involve iron . Overall, we recognise that these kinds of inflammatory, oxidative stress-related reactions are accumulative and somewhat irreversible , that they are consequently age-related, and (see [162–165] and later), and that most diseases and causes of mortality that are prevalent in the developed world are in this sense largely manifestations of this kind of aging. As well as the reactions described above, ferrous ions will react with oxygen under aerobic conditions to produce ferric ions, and in natural environments there is little to stop this. Consequently, and because these reflect fundamental physicochemical properties of such ions, the problems of both solubility and toxicity were faced by bacteria (and indeed fungi [166–169]) long ago in evolution, and were solved by their creation and excretion of (mainly ferric-)iron chelators known as siderophores [170–189] (and for haemophores see ). These typically have extremely tight binding constants (Kf > 1030 ) and can solubilise and sequester iron such that it can be internalised via suitable transporter molecules within the bacterial plasma membrane . Bacterial and fungal siderophores usually form hexadentate octahedral complexes with ferric iron and typically employ hydroxamates, α-hydroxycarboxylates and catechols as extremely effective Fe3+ ligands . Since bacterial growth requires iron, it is unsurprising that siderophores are effectively virulence factors (e.g. [174, 193–196]). While upwards of 500 microbial siderophores have been identified , with new ones still appearing (some via genomic analyses, e.g. ), and with the most common one in medical use, desferrioxamine or DFO, being such a bacterial product (see below), it is an astonishing fact that no human siderophore has been chemically identified, even though such activities were detected nearly 30 years ago [198, 199] (see also [200–205]). As noted by Kaplan , "a discovery that mammals produce siderophores would lead to an epochal change in the paradigm of mammalian iron homeostasis." To this end, some recent events have begun to change matters, and our overall knowledge of the regulation of iron metabolism, considerably. The total body iron in an adult male is 3000 to 4000 mg and the daily iron requirement for erythropoiesis, the major 'sink', is about 20 mg . However, the loss of iron in a typical adult male is very small [208, 209] and can be met by absorbing just 1 – 2 mg of iron per day [210, 211]. The careful conservation and recycling of iron – mainly from degrading erythrocytes – is in fact essential because typical human diets contain just enough iron to replace the small losses, although when dietary iron is more abundant, absorption must be (and is) attenuated since higher levels than necessary lead to iron overload and many distressing sequelae contingent on the radical production described above. A variety of aspects of mammalian iron metabolism have been reviewed in detail elsewhere (e.g. [134, 139, 195, 212–241]), including a series on 'iron imports' [242–248], and for our present purposes (Fig 2) mainly involves the intestinal (mainly duodenal) uptake of Fe(II) (produced from Fe(III) using a luminal ferrireductase) via a divalent metal ion transporter DMT1/DCT1/NRAMP [249, 250] and its subsequent binding as Fe(III) to transferrin (Tf). The intestinal uptake of haem (heme) occurs via the heme carrier protein-1 (HCP1)  and it is thereby internalized, while the iron in heme is liberated by heme oxygenase-1 (HO1) [252–254]. Haem is synthesised in many tissues, especially liver and erythroid cells . Vesicular routes of intestinal transfer may also occur [256, 257]. Low MW cytoplasmic chelators such as citrate can bind iron fairly weakly and thereby contribute to a labile iron pool (LIP) in the cytoplasm and especially the lysosomes and mitochondria (see [258–262]), while ferritin  too can bind cytoplasmic iron (via a chaperone ) and is seen as a good overall marker of iron status [265–267]. Iron(II) is subsequently exported through the basolateral membrane of the enterocyte by ferroportin-1 (FPN1) [268–270]. Ferroportin may also contribute to uptake in enterocytes . Fe(III) may then be produced by hephaestin (Hp)  before it is bound by transferrin (Tf), which is the main but not sole means of binding Fe(III) when it is transported through the circulation, with major iron storage taking place in the liver. Similar processes occur in the peripheral tissues, with significant transfer of iron from transferrin occurring via the transferrin receptor . Schematic overview of the main elements considered to participate in mammalian iron metabolism. All of the above obviously ignores both some important aspects of the speciation and liganding of iron, as well as the tissue distribution of the specific proteins involved – for which latter global information will shortly emerge  (http://www.proteinatlas.org/ and see later). It also ignores any discussion on the genetic regulation of iron metabolism (e.g. [285–288]), which is not our main focus. However, one molecule in particular, hepcidin, has recently emerged as a 'master regulator' of regulation at the physiological level, and we describe some of these new developments. 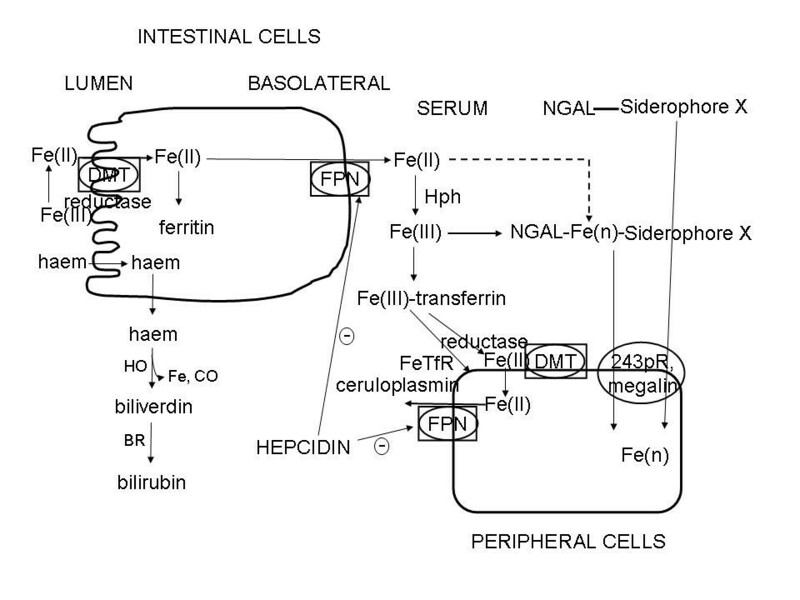 In the liver and elsewhere, many aspects of iron metabolism are regulated by a recently discovered 25-amino acid polypeptide called hepcidin [207, 241, 245, 271, 289–327] that acts in part as a negative regulator of iron efflux  by causing the internalisation of ferroportin [329–333]. Hepcidin is produced, partly under the regulation of a receptor called hemojuvelin (e.g. ), via an 84-aa precursor called pre-pro-hepcidin and a 60 mer called pro-hepcidin [304, 335, 336] although the active agent is considered to be the 25 mer referred to above, and with the inactive precursors appearing not to be useful markers [337, 338]. Strikingly, anaemia and anoxia both suppress hepcidin production [245, 339, 340] (Fig 3), such that just while superoxide production is being enhanced by the anoxia there is more iron being absorbed from the intestine and effluxed into the circulation. In view of the inter-reactivity of superoxide and iron this could be anticipated to enhance free radical formation, leading to a positive feedback loop in which the problems are amplified: ischaemia/anoxia changes Fe(n) distribution leading to differential reactivity with the products of anoxia and thus further free radical production. However, hepcidin is overexpressed in inflammatory disease and is an early inflammatory marker [245, 341–345]. Its expression is positively controlled inter alia by SMAD4, and loss of hepatic SMAD4 is thus associated with dramatically decreased expression of hepcidin in liver and increased duodenal expression of a variety of genes involved in intestinal iron absorption, including Dcytb, DMT1 and ferroportin, leading to iron overload . STAT3 is another positive effector of hepcidin expression [347, 348], and ROSs inhibit this effect , thereby creating a link between ROSs and Fe metabolism. To understand the exact roles of hepcidin in iron metabolism, it is going to be especially important to understand where it is expressed; fortunately, such studies are beginning to emerge . 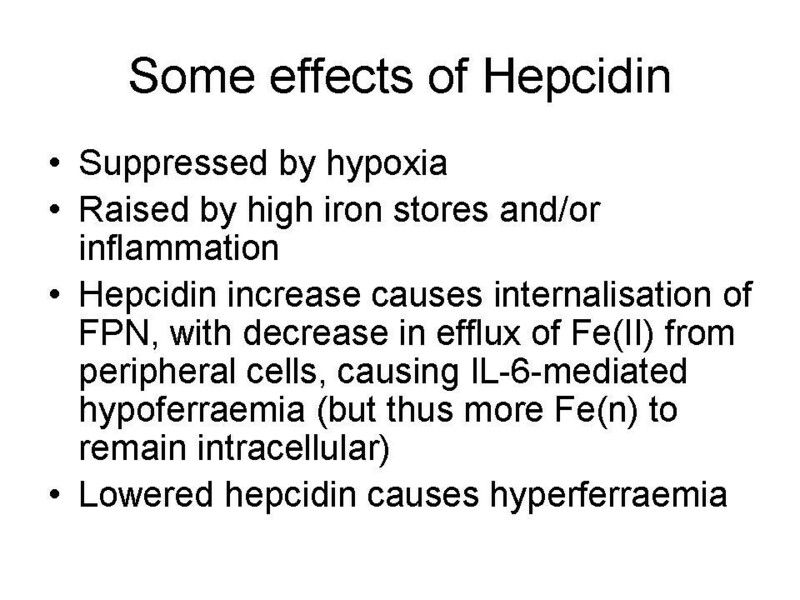 Some effects of hepcidin, summarizing the fact that hypoxic condition can suppress it and thus lead to hyperferraemia. Since hypoxic conditions can also lead to ROS production the hypoxia-mediated regulation of hepcidin can have especially damaging effects. Overall there is a complex interplay between positive and negative regulation and the organismal distribution of iron caused by changes in hepcidin concentration , with in many cases the hypoxic response (decreased hepcidin) seeming to dominate that due to inflammation (increased hepcidin) even when iron levels are high [352, 353]. Specifically, lowered hepcidin causes hyperferraemia. Hepcidin is also activated by p53 , and may play a role in the degradation of atherosclerotic plaques . Another recently discovered protein that is crucially involved in human iron metabolism is NGAL or siderocalin, and while there is some evidence for their co-regulation , they have normally been studied separately. Lipocalins  are a diverse group of ligand-binding proteins that share a conserved structure even in the absence of significant sequence conservation. This core structure includes an eight-stranded anti- parallel β barrel that defines a calyx, or cup-shaped structure, enclosing the ligand binding site. NGAL – neutrophil gelatinase-associated lipocalin – is a 21 kDal glycoprotein first isolated by Kjeldsen and colleagues in 1993 . Synonyms include lipocalin 2, siderocalin, Lcn2, α2-microglobulin-related protein or neu-related lipocalin (in rats) [359, 360] and (in mice) 24p3 or uterocalin . Although lipocalins are well known to be involved in the sequestration and transport of a variety of ligands, the natural ligand of NGAL (as is the case with many lipocalins) was not initially known even in terms of its chemical class. This changed with the seminal paper of Goetz and colleagues  (and see ) who purified recombinant NGAL from a particular strain of E. coli and found that its structure contained a negatively charged ferric siderophore with a subnanomolar dissociation constant that it had extracted from its bacterial host, and that the apo form of this molecule could also act as a potent bacteriostatic agent by sequestering iron (see also [363–367]). A companion paper  showed that the iron-delivering activity was expressed in mammalian cells. The structure of NGAL is now known  and one of its interaction partners is a matrix metalloproteinase  to which it can presumably donate a metal ion and in the complex decrease its degradation . The finding that NGAL was one of the most highly expressed proteins following ischaemia-reperfusion injury in kidney cells [372–374], and prognostic of kidney damage long before the more traditional marker creatinine was raised significantly, has led to considerable interest in this protein, especially as a marker of renal injury [375–389], and perhaps as a therapeutic . Devireddy and colleagues  identified a receptor that internalizes 24p3, and internalization of iron bound to 24p3 prevents apoptosis. In contrast, internalization of the apo form of 24p3 that does not contain iron led to cellular iron efflux and apoptosis via the proapoptotic protein Bim . In humans the megalin receptor can bind siderocalin (and its siderophore payload) and mediate its intracellular uptake . Oxidative stress can also induce its expression , and it is protective against it . Exogenously administered NGAL also markedly upregulates heme oxygenase-1, a proven multifunctional protective agent in experimental Acute Kidney Injury (AKI) that is thought to work by limiting iron uptake, promoting intracellular iron release, enhancing production of antioxidants such as biliverdin and carbon monoxide, and inducing the cell cycle regulatory protein p21 [279, 395, 396]. Because of this multifaceted protective action, NGAL has emerged as a prime therapeutic target in ischaemic AKI . Structural and direct binding studies have suggested that siderocalin tends (although not exclusively) to bind catecholate-type ligands, rather than hydroxamate- or carboxylate-based siderophores, at least when tested with microbially derived siderophores [362, 363, 365] (but cf. for claims, disputed  and not now accepted, as to the binding of bacterially derived formyl peptides!). The role of NGAL, as a siderophore-binding agent, is thus consistent with the widespread recognition that iron-induced radical generation is intimately involved in a variety of renal and other diseases [397, 398]. However, while it is certainly the case that siderocalin can reduce the virulence of bacteria when it binds the relevant bacterial siderophores [362–367] and that bacteria can 'evade' this by synthesising siderophores that siderocalin cannot bind (e.g. [186, 187, 399–401]), it is questionable whether the only role of siderocalin lies in fact in its antibacterial activity. Rather we would suggest that its main role is in sequestrating iron via a human siderophore to stop inappropriately liganded iron from producing damaging oxygen radicals. Consistent with this iron-liganding role for human biology is the fact that the tissue most highly expressing NGAL under normal conditions is bone marrow [360, 402], the site of erythropoiesis. The liganding can be extensive; as Goetz and colleagues  note, "During inflammation, concentrations of NGAL can increase to levels, with concentrations approaching 20–30 nM in the serum , presumably adequate to bind all available iron as ferric siderophore complexes". Significant changes in NGAL expression have also been observed, for instance, during kinase-mediated signalling [404, 405], in cardiovascular disease [406–409] and in cancer [410–412]. These findings on the kidney and the role of NGAL, together with the important knowledge that its chief ligand is probably an unknown human siderophore (Figs 2, 4), thus lead us to consider the role of this system (and unliganded iron generally) in a whole series of other diseases that all share many characteristics of oxidative stress and inflammation (see also ). A similar thesis, albeit with comparatively little stress on iron, is the leitmotif of Finch's recent detailed monograph . The theme of these sections is thus to stress the fact that while the role of ROSs in general in such syndromes has been pointed up previously, that of iron as a major culprit has not so generally yet been stressed, notwithstanding that there is in fact a great deal of pertinent literature that we here highlight as the focus of this review. Overview of the roles of ischaemia, ROSs, poorly liganded iron and the iron metabolism regulators HGAL and hepicidin in effecting inflammation as a physiological level. Another important disease that shares many of the same properties (or at least sequelae) of renal impairment, and may have the same fundamental aetiology, is pre-eclampsia. This is the most significant cause of morbidity and mortality in pregnant women . The chief clinical manifestations at time of diagnosis are a raised blood pressure (hypertension)  and proteinuria, together with raised creatinine, consistent with the reversible existence (since it is relieved upon delivery of the baby) of renal impairment. However, prognostic markers that might manifest early in pregnancy are lacking, and would be highly desirable. There is widespread agreement  that a poor connection of the placenta to the uterus leads to ischaemia and thus oxidative stress, with a substantial involvement of apoptosis during the placental remodelling [417–423]. Since preeclampsia-like syndromes can be induced in pregnant animals by surgical restriction of the uteroplacental blood supply , it is presumed that blood-borne agents arising from the ischaemic placenta are the cause of the generalized endothelial cell damage and inflammatory responses that give rise to the symptoms of hypertension, proteinuria, and sudden oedema characteristic of preeclampsia . Indeed, many studies implicate oxidative stress as a substantial contributor to this [425–489], while some have noted the importance of iron status [70, 133, 450, 490–511], and so far as is known the transporters of iron in the placenta are similar to those in other cells . Oxidative stress of this type is of course inflammatory in nature and inflammation is observed in PE [472, 476, 484, 486, 513–519]. We suggest strongly that it is the combination of inadequately liganded Fe(II or III) and superoxide/peroxide leading to OH• formation that is the chief mechanistic cause of the downstream events that manifest in PE, and that appropriate removal by liganding/chelation or otherwise of these ions would prove of therapeutic benefit. (Iron status has also been implicated in other pregnancy and neonatal disorders [520–524].) There is evidence too for the involvement of the radical NO [456, 525]. We note that it is quite common nevertheless for iron to be prescribed during pregnancy, especially during its latter stages [526, 527], and that this does of course lead to oxidative stress [528, 529]. Oxidative stress is caused both by the initial rate of production of superoxide and the rate of their conversion into OH• radicals. The former can be induced by hypoxic conditions such as occur at high altitude, and one prediction, that is borne out [487, 530], is that PE should therefore be more prevalent at high altitude. Erythropoietin may be a marker for oxidative stress in pre-eclampsia . Regarding the second stage, predictions include that PE should be more common in those suffering from diseases of iron metabolism. Although such mothers are of course less well a priori, this prediction is borne out for α-thalassemia [532, 533] although not, interestingly, for haemochromatosis . We note in this context that thalassaemia not only predisposes towards PE but is known in general to cause hepcidin to decrease and NGAL to increase [352, 353, 356, 535], with consequent and inevitable iron dysregulation. Another prediction is then that hepcidin should be changed in pre-eclampsia. Although no serum measurements have been reported to date, it is of extreme interest that – while they took it to be an antimicrobial peptide rather than an iron regulator – a recent study by Knox and colleagues of placental gene expression in a mouse model of PE showed that hepcidin expression increased by a greater factor than that of any other gene save one , consistent with the view that major changes in the regulation of iron liganding and metabolism underpin PE. Finally, we note that NGAL is significantly implicated in pregnancy, and was even named uterocalin in mice to reflect its high expression in the uterus [361, 537–539]. A very recent study  suggests that it may be a useful second trimester biomarker for pre-eclampsia. Type 2 diabetes and insulin resistance are known complications of pregnancy (e.g. [541–545]), and also predispose towards PE. In a similar vein, various types of pregnancy-related intrauterine growth restriction predispose towards diabetes in later life [546, 547], pointing up the progressive nature of these syndromes. Metabolic biomarkers for the one can thus be predictive of the other , consistent with a common cause. Certainly ROSs are known to play a substantive role in both insulin resistance [549–556] and in a variety of diabetic sequelae [95, 557–559], and mitochondrial dysfunction may be an early step in this . Some anti-diabetic drugs, such as the 'glitazones' that are considered to act on Peroxisome Proliferator Activated Receptor (PPAR)γ, may also act by decreasing ROS production (e.g. [561–565]), and are even active aganst cerebral ischaemia and stroke [566–569]. As with most if not all of the other diseases we review here, studies of pro-inflammatory markers (such as TNF-α, IL-1 and C-reactive protein ) during the development of diabetes show its aetiology to be inflammatory in nature [553, 571–590]. Iron 'excess' is also a known feature of gestational diabetes [591–593], and is a clear risk factor for the disease even in 'normal' populations [594–603], and indeed diabetes is a classical consequence of iron overloading as seen in hereditary haemochromatosis . Serum ferritin and body iron stores are strongly associated with diabetes [603, 605–609], including prospectively , while changes in visfatin are also intimately involved in changes of iron metabolism (with pro-hepcidin being elevated) . Most importantly, lipocalin 2 (siderocalin/NGAL) is strongly associated with the development of diabetes [612, 613]. Lowering iron improves insulin sensitivity [598, 614], and metallothionein is also protective [615–619]. There seems little doubt that iron status is a major determinant of the development of type 2 diabetes . Non-transferrin-bound iron is also considerably elevated in type 2 diabetes , and this too is exacerbated by vitamin C. Iron metabolism is substantially deranged in type 2 diabetes and the metabolism of glucose (a reducing sugar) interacts significantly with iron metabolism . Iron is also strongly implicated in non-alcoholic steatohepatitis, considered an early marker of insulin resistance [622–624]. Well-known diabetic complications include retinopathies, and it is noteworthy that elevated levels of ferritin can lead to cataract formation [625, 626]. Although some of its origins may be pre-natal , many of the features of these diseases are also seen in the (so-called) Metabolic Syndrome [627–631]. Thus, serum ferritin is also related to insulin resistance [606, 632, 633] and iron levels are raised [624, 634, 635]. Of course diabetes and the Metabolic Syndrome are also closely coupled, so it is reasonable that features observed in the one may be observed during the development of the other. The metabolic syndrome is also an independent indicator for chronic kidney disease  and may be related to liver steatosis . Metabolic disorders of this type too are closely intertwined with inflammation [575, 581, 587, 638], that is of course stimulated by ROSs whose generation is increased by high-fat diets . Thus, our role here is to point up the existence of a considerable body of more-than-circumstantial evidence that here too the progressive and damaging nature of these diseases may be caused, in part, by inappropriately chelated iron. It is well known that there has been a staggering increase in the prevalence of obesity, diabetes, and especially type 2 diabetes, in the last 50 years or so, and that this increase is expected to continue (e.g. [641–643] and http://www.who.int/diabetes/). Equally, it is now well known that obesity, metabolic syndrome, diabetes and cardiovascular diseases are all more or less related to each other , and the question arises here as to whether dysfunctional iron metabolism might be a feature of each of them. In the case of obesity per se, however, we see no major evidence as yet for a causative role of deranged iron metabolism or chelation in causing obesity. Indeed, while they are related , what little evidence there is [645, 646] suggests that the converse may be true, i.e. that changes in iron metabolism might be consequent upon obesity (possibly via peroxide generation ). Importantly, considerable evidence suggests that obesity and inflammation are significantly related [163, 486, 575, 581, 642, 647–664], not least because adipocytes produce and release various adipokines including pro-inflammatory cytokines such as IL-6 and TNF-α [575, 649, 650, 665–671]. It is likely that it is the combination of overfeeding-induced obesity and inflammation (partly induced by the obesity itself ) that leads to diabetes . Certainly there is evidence for increased ROS production in obese mice, possibly mediated in part via the fatty acid-induced activation of NAPH oxidase , while obesity is linked [675, 676] to urinary levels of 8-epi-PGF2α, a well established marker of oxidative stress (qv). 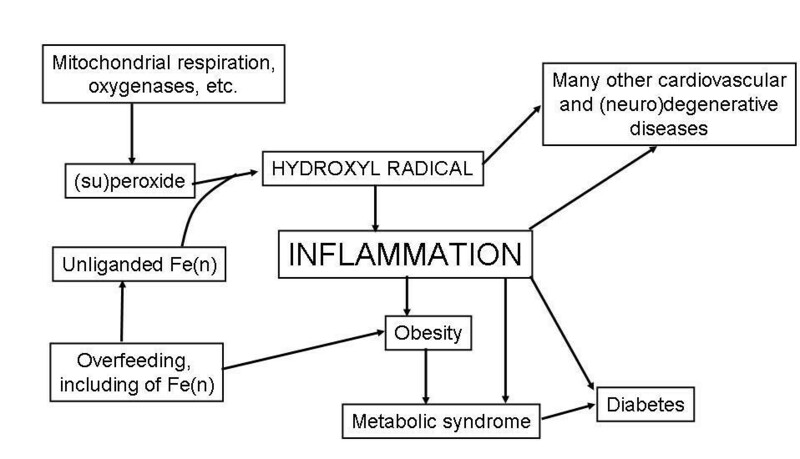 Fig 5 summarises the above in a manner that stresses the roles of iron, overfeeding and inflammation in the genesis of these processes, and notes that interference in several of these steps is likely to be required to limit their progression to best advantage. Role of inflammation caused by hydroxyl radical formation in the interactive development of obesity, the metabolic syndrome and diabetes. Intervention at multiple steps is likely to be most beneficial in alleviating this kind of progression. As well its significance in pre-eclampsia (see above), hypertension is a well known risk factor for many cardiovascular and related disease (e.g. ), and there is considerable evidence that its underlying cause is inflammatory in nature [678–686], is related to the metabolic syndrome and obesity (e.g. [648, 687–691]), and may be mediated mainly via ROSs . There is evidence that some of its sequelae may be mediated via iron [693, 694]. It is well known that elevated iron stores can predispose to coronary artery disease and thence myocardial infarction. The 'iron hypothesis' of the benefits of some iron depletion due to menstruation was devised to account for the lowering of heart-disease risk in young women (that disappears in those post-menopause) and was proposed by Jerome Sullivan in 1981 [695–698] (and see also [699, 700]). (In this sense, the lack of menstruation during pregnancy would predispose to a comparative abundance of iron, as is indeed found – see above.) It is of particular interest that the well-known adverse vascular effects of homocysteine (in inhibiting flow-mediated dilatation) are in fact iron-dependent [701–703], and that reducing homocysteine (e.g. by folate supplementation) in the absence of lowering iron has shown no clinical benefit to date , thereby suggestion iron mediation. By contrast, iron stores represent an established risk factor for cardiovascular disease . Of course many factors such as lipid levels, stress, smoking and so are well-known risk factors for cardiovascular, coronary artery disease and related diseases. Indeed kidney disease is well established as a risk factor for cardiovascular disease [706–708] (and indeed stroke ), all consistent with their having in part a common cause – we believe inflammation). Our purpose here, within the spirit of this review, is to indicate the evidence for the involvement of inappropriately chelated iron in cardiovascular diseases too. 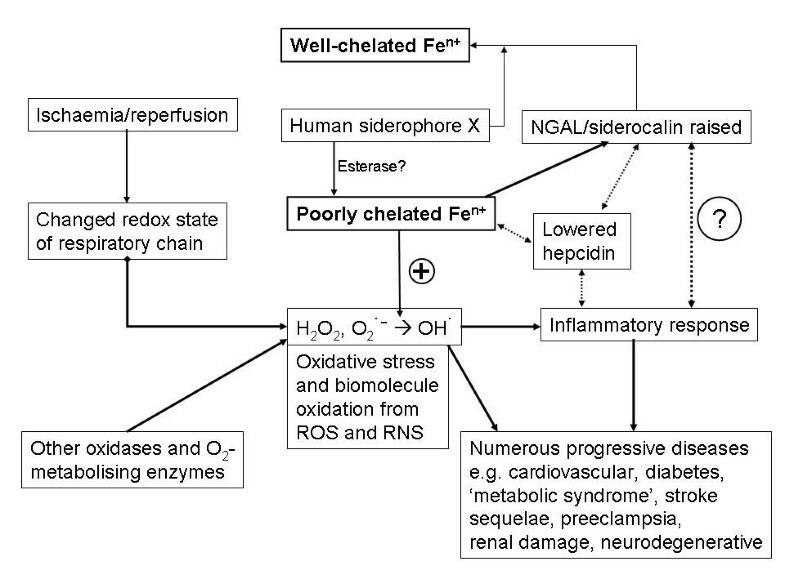 There is no doubt that the iron-mediated causal chain of ischaemia → (su)peroxide → OH• radical formation occurs during the development of heart disease, especially during reperfusion injury [710–713], and suitable iron chelators inhibit this [714, 715] (see also [716, 717], and for thalassaemia ). Iron is also involved in the protection that can be produced by ischaemic preconditioning [719, 720]. Erythropoietin, a hormone with multiple effects that may involve iron metabolism, is also protective [721, 722]. The sequelae of heart failure are complex, and involve a chronic and continuing worsening of a variety of physiological properties. ROSs are certainly involved here, since allopurinol (a potent inhibitor of xanthine oxidase) improves prognosis considerably , and uric acid is a well known biomarker for heart failure (see e.g. [724, 725]). Biopyrrins, degradation products of bilirubin and thus markers of oxidative stress are also considerably increased . Anaemia is a common occurrence (and risk factor) in heart failure [727–729], again implying a role for dysregulated iron metabolism and a need to understand the exact speciation of iron in chronic anaemias linked to inflammatory diseases . It is next on the formation of atherosclerotic plaques that our attention is here focussed.